Acute osteomyelitis is the inflammation of bone caused by pyogenic organisms typically the duration of symptoms is less than two weeks. Haematogenous spread is the most common source of infection in children typically affecting the metaphysis of long bones where blood flow is rich but sluggish. Other sources of infection are tracking from adjacent foci of infection and direct inoculation from trauma or surgery. The femur and tibia are most commonly affected (27% and 26%). In long bones where the metaphysis is intracapsular the shoulder, ankle, hip, and elbow, in decreasing order of incidence the infective foci may extend into the joint space, resulting in concurrent septic arthritis. In paediatric patients under 18 months of age, anatomical transphyseal vessels facilitate translocation of bacteria from the metaphysis to infect the epiphysis and adjacent joint, increasing the risk of concurrent septic arthritis. Over the last decade, our understanding of the etiology of this infection has changed, with increased recognition of Kingella kingae the dramatic increase in community-associated Methicillin-resistant Staphylococcus aureus (MRSA) infections. There is a need for the optimization of diagnostic strategies, such as MRI and serum inflammatory markers. Acute osteomyelitis is problem in the paediatric population, affecting approximately 5/10,000 children each year and accounting for approximately 1% of all paediatric hospitalizations. In high-income countries, acute osteomyelitis occurs in about 8 of 100,000 children per year, but it is considerably more common in low-income countries. Boys are affected with acute osteomyelitis twice as often as girls. Acute hematogenous osteomyelitis is particularly common in young children, typically in metaphyseal ends of long bones, due to the highly vascular nature of the growing bone. Less common aetiologies of osteomyelitis include trauma, surgical complications, or extension from adjacent soft tissue. Staphylococcus aureus is the most frequently causative pathogen in patients with acute osteomyelitis being cultured in 70-90% of culture positive cases. Other causative pathogens include Streptococcus pyogenes, Streptococcus pneumoniae, and Kingella kingae. Salmonella More Details especially the non-typical serotypes (S typhimurium, S enteriditis, S choleraesius) can be an important causative pathogen in children with sickle cell disease. Patients with sickle cell disease and suspected osteomyelitis require a completely different antibiotic regimen, and infectious disease advice should be sought. It has been suggested that tiny infarctions in the gastrointestinal tract lead to salmonella bacteraemia and ultimately to osteomyelitis. Resistant strains emerging with changing pattern of causative organisms over the past few decades are a matter of concern. Previously the most common Gram-negative organism in paediatric osteomyelitis was Haemophilus influenzae s now become rare because of the vaccination programmes. The incidence of community acquired MRSA is increasing in many parts of the world. MRSA is a causative agent in 9-30% of children with osteomyelitis and needs altered antibiotic treatment regimens as the severity of disease is different. MRSA osteomyelitis can cause a more aggressive and complicated infection, with higher fever and an increased likelihood for repeated surgical debridement, prolonged hospital stays compared with other pathogens, associated with many complications, including multiorgan failure, deep vein thrombosis (10%), septic pulmonary emboli, multifocal infection, subperiosteal abscesses, fractures (20%), and progression to chronic osteomyelitis. Cases of osteomyelitis have been documented of PVL-MRSA (Panton-Valentine Leukocidin Methicillin Resistant Staphylococcus Aureus), an extremely virulent strain. Primary deficiencies of cell mediated immunity are rare. Secondary causes like steroid use, malnutrition, SLE, lymphoma and autoimmunity deficiency syndrome can sometimes be responsible for osteomyelitis. Children with malnourishment, diabetes, malignancy, HIV, on prolonged steroid therapy are immunocompromised which makes them susceptible to infections like osteomyelitis. Hospitalized premature infants are predisposed to osteomyelitis owing to their immature immune systems and exposure to repeated invasive intravenous or intraarterial procedures providing a portal for haematogenous spread. The systemic signs of infection may be subtle, however pronounced leucocytosis is typically seen. In the clinical setting of patients with Diabetes, hematological malignancies, cytotoxic drugs organisms like Staphylococcus aureus, aspergillus, gram negative and candida infections are common. In patients with Hypogammaglobulinemias and post splenectomy patients-Hemophilus, Streptococcus pneumoniae Niesseria infections are common. Osteomyelitis caused by atypical organisms are often termed atypical osteomyelitis. Microvascular obstruction by the sickled red blood cells in patients with sickle cell disease result in tissue ischaemia and infarction. This, in combination with impaired immune function and splenic dysfunction, leads to an increased risk of osteomyelitis, with Salmonella the most common causative organism. Salmonella is commonly considered in the differential diagnosis of osteomyelitis in children with sickle cell anemia but Salmonella osteomyelitis and septic arthritis are rare in immunocompetent children who do not have sickle cell disease or trait. Salmonella is an encapsulated, motile, facultative anaerobic bacillus, gram negative, coliform group bacteria belonging to the family of enterobacteraciae. The reported incidence of Salmonella osteomyelitis is 0.45% in normal population and it is 70% in children with sickle cell disease. The coincidence of large tribal populations with the ‘sickle cell belt’ of Central India and northern Kerala and Tamil Nadu has given rise to the assumption that tribal people are more prone to the Hbs gene although this seems widely distributed among tribal and non-tribal people. Sometimes striking differences have been reported, a tribal population in Valsad having milder disease than a non-tribal population in Nagpur. Little is known about many other aspects of sickle cell disease in India, including which infections are important, and the role of antibiotic prophylaxis., It is difficult to differentiate a vaso-occlusive crisis-which is far more common from osteomyelitis in children with sickle cell anemia as both often present with fever and a painful, swollen limb with restricted joint motion. The classical clinical picture of an unwell, febrile child unable to walk due to limb pain with a high white cell count is increasingly uncommon. The onset of osteomyelitis can be insidious, the clinical presentation variable, and the physical findings non-specific. No single test can confirm or rule out acute osteomyelitis. A combination of careful history and examination, accompanied by a high index of clinical suspicion, and followed by laboratory and imaging studies are key to an early diagnosis. The commonest presenting features are pain, swelling and erythema, fever, reduced joint movement or pseudo-paralysis, and reduced weight bearing or a limp. Fever in immunocompromised group is not a major symptom, and the infection, particularly in premature infants, may be multifocal. Multifocal disease is rare but presents as multiple acute foci of infection, affecting mainly the femur and tibia, or the tibia and humerus simultaneously. Traditionally erythrocyte sedimentation rate (ESR) and leukocyte cell count have been used, whereas C-reactive protein (CRP) has gained in popularity. CRP normalizes faster than ESR, providing a clear advantage in monitoring recovery. Declining levels of CRP usually suggest a favourable response to treatment even if the fever continues. Acute osteomyelitis due to MRSA causes greater elevations in the CRP level, ESR and white-cell count. Procalcitonin levels are sensitive as diagnostic tests but measurements of procalcitonin are more expensive and rarely outperform CRP and is used infrequently. A systematic review found that only 36% of children will have a raised white cell count on presentation, 91% an increased erythrocyte sedimentation rate, and 81% an increased C reactive protein value. The sensitivity is highest when both the erythrocyte sedimentation rate and C reactive protein are increased (98%). 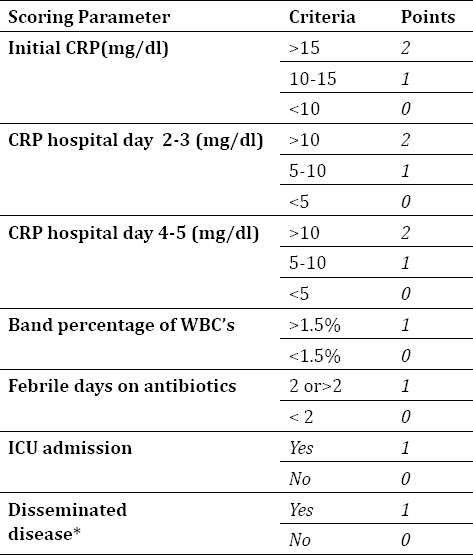 C reactive protein values >100 mg/L are particularly significant for concomitant septic arthritis and are also the best predictor of a complicated course and the need for prolonged intravenous antibiotics. Acute hematogenous osteomyelitis most commonly affects long bones which account for about ¾ th of cases of osteomyelitis. Lower extremity bones femur (23-29%), tibia (19-26%), and fibula (4-10%)—slightly more commonly involved than the upper extremity locations— humerus (5-13%), radius (1-4%), and ulna (1-2%). Other bone infections occur with a reported incidence are- pelvic osteomyelitis (3-14%), calcaneal osteomyelitis (4-11%), hand involvement (1-2%), and vertebral spondylodiscitis (1-4%).,, The predisposing factors for osteomyelitis are mentioned in [Table 1]. 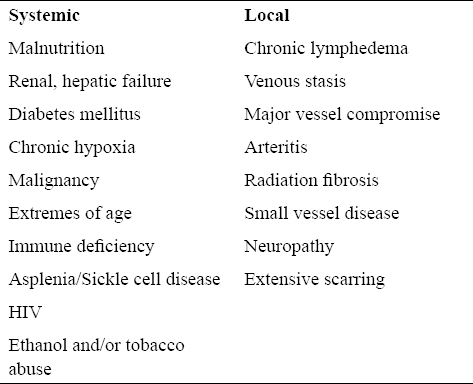 Table 1: Systemic or Local Factors predisposing to Osteomyelitis. Most commonly by hematogenous spread bacteria proliferate after getting lodged in the metaphysis and induce an acute inflammatory reaction. In the neonate the metaphyseal vessels penetrate the growth plate, resulting in frequent infection of the metaphysis, epiphysis, or both. In children, localization of microorganisms in the metaphysis is typical. After growth plate closure, the metaphyseal vessels reunite with their epiphyseal counterparts and provide a route for the bacteria to seed the epiphyses and subchondral regions in the adult. Bone is a closed tube and the bacteria and inflammation spread within the shaft of the bone. If infection continues purulent material works its way through Haversian system and Volkmann’s canals to reach the periosteum. The entrapped bone undergoes varying degrees of necrosis within the first 48 hours. In children the periosteum is thick and acts as a barrier to further spread of the purulent material into the soft tissues. However, the periosteum is loosely attached to the cortex and sizable sub periosteal abscesses may form that can track for long distances along the bone surface. Lifting of the periosteum further impairs the blood supply to the affected region, and both the suppurative and the ischemic injury may cause segmental bone necrosis; the dead piece of bone is known as a sequestrum. Rupture of the periosteum leads to a soft-tissue abscess and the eventual formation of a draining sinus. Sometimes the sequestrum crumbles and forms small fragments that pass through the sinus tract classical of chronic osteomyelitis. After the first week chronic inflammatory cells become more numerous and their release of cytokines stimulates osteoclastic bone resorption, ingrowth of fibrous tissue, and the deposition of reactive bone in the periphery by the periosteum. When the newly deposited bone forms a sleeve of living tissue around the segment of devitalized infected bone, it is known as an involucrum. In neonates, epiphyseal infection can spread through the articular surface or along capsular, tendinous and ligamentous insertions into a joint, producing septic or suppurative arthritis, which can cause destruction of the articular cartilage and permanent disability. A similar process involves the vertebrae, in which the infection destroys the hyaline cartilage end plate and intervertebral disc and spreads into adjacent vertebrae producing spondylodiscitis. Samples for blood cultures should be taken before antibiotics are started as it may be the only positive source of identification of the pathogen. Blood cultures may be positive in only 50% of cases. If positive, cultures should be repeated daily until two consecutive cultures are reported negative. Aspirates from soft tissue, sub periosteal or joints can have a higher yield (70%) and can be obtained even after antibiotics have been administered. Positive culture yields can be improved if specimens can be obtained guided by ultrasound, computed tomography or surgery; and should be sent for urgent Gram stain and culture in commercially available blood culture bottles. Special culture media especially in immune-compromised settings, patients with suspicion of penetrating inoculation or failed primary treatment may be necessary for the isolation of mycobacteria, fungi, and less common anaerobic pathogens. In some cases, histopathologic examination of biopsy specimens may be the only way to make a diagnosis. High-quality plain radiographs in two orthogonal planes should be obtained in all cases to evaluate for deep soft tissue swelling, joint effusions, and skeletal lesions. Plain x rays often show soft tissue swelling but are unremarkable otherwise. In some instances, joint space widening is discernable due to fluid accumulation in the joint. For bony destruction to be discernable on x-rays requires persistent infection for 2-3 weeks as bony matrix must be destroyed at least 30-50% for bony destruction to be visible. A normal radiograph on admission to the hospital by no means rules out acute osteomyelitis, but it can be helpful in ruling out a fracture or detecting Ewing’s sarcoma or another type of malignant condition. In 95% of cases, the technetium radionuclide scan using 99mTc diphosphonate is positive within 24 h of the onset of symptoms. Radionuclide scanning is useful when X-rays and CT scan are normal. Technetium 99 is the most commonly used radioisotope for acute osteomyelitis. The uptake in different phases of the bone scan allows a distinction to be made as to the cause of the increased uptake. Falsely negative scans usually indicate obstruction of blood flow to the bone. Because the uptake of technetium reflects osteoblastic activity and skeletal vascularity, the bone scan cannot differentiate osteomyelitis from fractures, tumors, infarction, or neuropathic osteopathy. Gallium citrate scan is more specific for infection as it is directly taken up by leucocytes and allows a clearer differentiation to be made if both technetium and Gallium scans are done. In patients with acute osteomyelitis-Gallium uptake is greater than Technetium uptake. The disadvantage is the slow clearance by the tissues and it may take 24 hours to get the scan results which may be too late for acute infections. Indium 111- labelled leucocyte scan is sensitive for acute osteomyelitis and for differentiating trauma and infections. 67Ga citrate- and 111In-labeled leukocyte or immunoglobulin scans, which have greater specificity for inflammation, may help distinguish infectious from noninfectious processes and indicate inflammatory changes within bones. Ultrasound can be used to diagnose osteomyelitis by the detection of sub-periosteal fluid collections, soft tissue abscesses adjacent to bone, and periosteal thickening and elevation. Both CT scans and ultrasound are useful for guiding percutaneous aspiration of sub-periosteal and soft tissue fluid collections. CT scanning although excellent for defining bony pathology has a limited application in the diagnosis and management of osteomyelitis. Major disadvantages of CT scanning are limited visualization of the anatomic and spatial extent of tissue inflammation due to infection and radiation exposure. CT scans have a sensitivity of 66% and a specificity of 97% for osteomyelitis in experimental animals. CT scans have a role in monitoring disease progression after initial MRI scanning. MRI is as sensitive as the bone scan for the diagnosis of acute osteomyelitis because it can detect changes in the water content of marrow and offers improved sensitivity and specificity than CT scanning. Contrast-enhanced MRI does increase reader confidence in the diagnosis of osteomyelitis and its complications in cases in which bone or soft-tissue edema is found on unenhanced images. In the clear absence of edema on unenhanced images, however, contrast enhancement is not needed. MRI yields better anatomic resolution of epidural abscesses and other soft tissue processes than CT and is currently the imaging technique of choice for vertebral osteomyelitis. MRI provides detailed information about the activity and the anatomic extent of infection but does not always distinguish osteomyelitis from healing fractures and tumors. MRI is particularly useful in distinguishing cellulitis from osteomyelitis in the diabetic foot; however, no imaging modality consistently distinguishes infection from neuropathic osteopathy. A multidisciplinary approach of continuation from MRI scanning to the OR as a single anaesthetic event can be safely performed and leads to rapid recovery and decreased hospital stay. Classification systems are important in documenting but need reproducibility and are clinically useful if they guide treatment or are helpful in prognostication. Cierny and colleagues proposed a classification system for chronic osteomyelitis based on host factors and anatomical criteria. This system is however for adults and has not been validated for children with normal immunity at the time of infection. A classification system has been proposed to assess the severity of illness using clinical, radiological and laboratory parameters. This simple scoring system guides treatment, prognosticate risk of complications and is easy to use [Table 2]. Table 2: Modified severity of illness scoring system for Acute hematogenous osteomyelitis. The other system of classification which is useful is to classify according to patient characteristics. This is useful in guiding treatment and reduce variability of care. Patients are classified according to age into your groups – Infantile (2-18 months), early childhood (18 months-3 years), childhood (3-12 years) and adolescent (12-18 years) and either nosocomial orcommunity acquired. The treatment of patients with acute osteomyelitis is multidisciplinary involving paediatrics, infectious diseases, orthopaedics, microbiology and radiology to ensure early diagnosis and effective management [Figure 1]. Initial treatment of acute osteomyelitis is instituted empirically before the causative agent and its resistance pattern are known in 2-3 days. Antibiotics in sufficient doses to eradicate the infection are given intravenously. The most relevant antibiotics must have an acceptable side-effect profile when administered orally because the doses are large. The antibiotics chosen should have satisfactory absorption and penetration into the bony structure. Clindamycin and first-generation cephalosporins are the obvious choices as they fulfil these criteria. Among the first-generation cephalosporins-Cephalothin and cefazolin are administered intravenously, cephalexin and cefadroxil are administered orally. If no parenteral first-generation agent is available, cefuroxime can be used for parenteral administration. The advantage of cefuroxime is that it is available in parenteral and oral preparations. As soon as the culture results are available antibiotic choice is guided by the susceptibility pattern of the identified organism and local microbiology advice sought wherever possible to facilitate a more appropriate therapeutic regimen. Most MRSA strains are susceptible to clindamycin and it is drill holes to decompress the intramedullary component of acute osteomyelitis of the femur (a) developed a pathological fracture due to trivial trauma 6 weeks later (b). She was treated by traction for 3 weeks followed by hip spica which resulted in uneventful healing at 6 weeks(c). Clindamycin is indicated if prevalence of MRSA in community is more than 10% and prevalence of clindamycin resistant S. aureus is less than 10%. Clindamycin use can cause sometimes skin rash and very rarely causes diarrhoea in children. Beta-lactam antibiotics are the drugs of choice for cases of osteomyelitis due to K. kingae, S. pyogenes or S. pneumoniae. The rare cases caused by H. influenzae type b usually respond to ampicillin or amoxicillin, if the strain is beta-lactamase–negative, or to a second- or third-generation cephalosporin, if the strain is beta-lactamase–positive. Osteomyelitis due to salmonella usually is susceptible to a third-generation cephalosporin, such as cefotaxime or ceftriaxone, or a fluoroquinolone. For patients in unstable condition an infectious disease consultation is essential and in areas where resistance to clindamycin is prevalent, vancomycin should be chosen as a first-line agent whereas linezolid is reserved for patients who do not have a response to vancomycin therapy. Shortened regimens of primarily oral antibiotics simplify the treatment as they reduce the cost of treatment, hospital stay, and the risk of adverse events; in addition, the risk of bacterial resistance is reduced. Prolonged parenteral antibiotics have a high complication rate of adverse drug reactions in 25-38% and catheter related complications in 50% patients. Currently the treatment of uncomplicated acute hematogenous osteomyelitis involves sequential parenteral to oral antibiotic therapy for 4 weeks with a demonstrated similar efficacy to longer regimens. Neonates, immunocompromised, malnourished, and patients with sickle cell disease are a group of patients who probably need a longer course of medication. The surgical indications and specific technique of surgery are not clearly defined. Conservative treatment is effective in up to 90% of cases of acute osteomyelitis if it is diagnosed early. In a series of 68 patients who underwent aggressive primary surgery, 17% of the patients had chronic osteomyelitis after the procedure. Problem peculiar to our nation is that antibiotics are often given without adequate workup and creates altered clinical signs and difficulties in diagnosis and treatment. Patients with large abscesses or having failure of antibiotic therapy within 48-72 hours are candidates for surgery. The surgical procedure may range from needle biopsy of bone and aspiration of subperiosteal abscess to creation of a cortical window and debridement of metaphyseal cancellous bone. Appropriate cultures and samples for histo-pathological examination are obtained during surgery. Data from prospective trials are required to explore these issues further and provide clarity. Rarely more than one procedure may be required to decrease the burden of infection if adequate response is not obtained. After surgery splints are provided for several weeks to prevent pathological fractures. Complications occur in approximately 6% patients with acute osteomyelitis – Recurrent infections, chronic osteomyelitis, avascular necrosis, pathological fractures, sepsis, growth plate injuries and deep vein thrombosis. The challenges in treatment of acute osteomyelitis lie with early diagnosis, appropriate antibiotic use and judicious use of surgery. Hospital admission that is delayed for 5 days or more is a probable risk factor for slow recovery and a poor outcome. Effective care of patients with osteomyelitis is a collaborative and multidisciplinary effort which needs to be evidence-based protocol driven. A lack of consensus in the Institution makes coordination of care difficult and can lead to an adverse clinical outcome. Careful monitoring of epidemiological trends of microbiology trends is imperative to formulate an antibiotic policy for acute osteomyelitis for effective treatment. Acknowledgement - The article was written with encouragement from Prof Shobha S. Arora, Head of the Department of Orthopaedics, AIIMS Rishikesh who also approved of the final manuscript in its current form. paediatric osteomyelitis: a systematic review of the literature. J Bone Joint Surg Br 2012;94:584-95. 2 Montgomery CO, Siegel E, Blasier RD, Suva LJ. Concurrent septic arthritis and osteomyelitis in children. J Pediatr Orthop 2013;33:464-7. Thomsen, I. & Creech, C.B. Curr Infect Dis Rep (2011) 13: 451. Vazquez M. Osteomyelitis in children. Curr Opin Pediatr. 2002;14(1):112-5. Grammatico-Guillon L, Maakaroun Vermesse Z, Baron S, Gettner S, Rusch E, Bernard L. Paediatric bone and joint infections are more common in boys and toddlers: a national epidemiology study. Acta Paediatr 2013;102(3):120-125. Long SS, Pickering LK, Prober CG. Principles and practice of paediatric infectious diseases. 3rd rev. ed. Philadelphia: Churchill Livingstone/Elsevier; 2008, 1618 p.
Howard-Jones AR, Isaacs D. Systematic review of duration and choice of systemic antibiotics therapy for acute haematogenous bacterial osteomyelitis in children. J Paediatr Child Health 2013;49:760-8. Chambers JB, Forsythe DA, Bertrand SL, et al. Retrospective review of osteoarticular infections in a pediatric sickle cell age group. J Pediatr Orthop. 2000;20(5):682-5. Hernigou P, Daltro G, Flouzat-Lachaniette CH, Roussignol X, Poignard A. Septic arthritis in adults with sickle cell disease often is associated with osteomyelitis or osteonecrosis. Clin Orthop Relat Res 2010;468:1676-81. Dodwell ER. Osteomyelitis and septic arthritis in children: current concepts. Curr Opin Pediatr 2013;25:58-63. Hawkshead JJ, Patel NB, Steele RW, Heinrich SD. Comparative severity of pediatric osteomyelitis attributable to methicillin-resistant versus methicillin-sensitive Staphylococcus aureus. J Pediatr Orthop 2009; 29:85-90. Martinez-Aguilar G, Avalos-Mishaan A, Hulten K, Hammerman W, Mason EO Jr, Kaplan SL, et al. Community-acquired, methicillin-resistant and methicillin-susceptible Staphylococcus aureus musculoskeletal infections in children. Pediatr Infect Dis J 2004; 23:701-6. Bocchini CE, Hulten KG, Mason EO Jr, Gonzalez BE, Hammerman WA, Kaplan SL. Panton-Valentine leukocidin genes are associated with enhanced inflammatory response and local disease in acute hematogenous Staphylococcus aureus osteomyelitis in children. Pediatrics 2006; 117:433-40. Williamson JB, Galasko CS, Robinson MJ. Outcome after acute osteomyelitis in preterm infants. Arch Dis Child 1990; 65:1060-2. Adeyokunnu AA, Hendrickse RG. Salmonella osteomyelitis in childhood. A report of 63 cases seen in Nigerian children of whom 57 had sickle cell anaemia Arch Dis Child 1980;55 :175- 184. Mukherjee MB, Lu CY, Ducrocq R, Gangakhedkar RR, Colah RB, Kadam MD, et al. Effect of á-thalassemia on sickle-cell anemia linked to the Arab-Indian haplotype in India. Am J Hematol. 1997;55:104-9. Patra PK, Khodiar PK, Hambleton IR, Serjeant GR. The Chhattisgarh state screening programme for the sickle cell gene: a cost-effective approach to a public health problem. J Community Genet. 2015;6:361-8. Goergens ED, McEvoy A, Watson M, Barrett IR. Acute osteomyelitis and septic arthritis in children. J Paediatr Child Health 2005:41:59-62. Sreenivas T, Nataraj AR, Menon J, Patro DK. Acute multifocal haematogenous osteomyelitis in children. J Child Orthop 2011;5:231-5. Pääkkönen M, Kallio MJ, Kallio PE, Peltola H. Sensitivity of erythrocyte sedimentation rate and C-reactive protein in childhood bone and joint infections. Clin Orthop Relat Res 2010; 468:861-6. Ju KL, Zurakowski D, Kocher MS. Differentiating between methicillin-resistant and methicillin-sensitive Staphylococcus aureus osteomyelitis in children: an evidence based clinical prediction algorithm. J Bone Joint Surg Am 2011;93:1693-701. Dartnell J, Ramachandran M, Katchburian M. Haematogenous acute and subacute paediatric osteomyelitis: a systematic review of the literature. J Bone Joint Surg Br 2012;94:584-95. Gillespie WJ, Mayo KM. The management of acute haematogenous osteomyelitis in the antibiotic era: a study of the outcome. J Bone Joint Surg Br 1981;63-B:126-31. Peltola H, Pääkkönen M, Kallio P, Kallio MJ. Short-versus long-term antimicrobial treatment for acute hematogenous osteomyelitis of childhood: prospective, randomized trial on 131 culture-positive cases. Pediatr Infect Dis J 2010; 29:1123-8. Section J, Gibbons S D, Greenberg DE, Jo CH, Copley LA. Microbiological culture methods for pediatric musculoskeletal infection: a guideline for optimal use. J Bone Joint Surg Am. 2015 Mar 18;97(6):441-9. Lazzarini L, Mader J T, Calhoun J H-Osteomyelitis in long bones: J Bone Joint Surg Am. 2004;86(10):2305-18. Mah E T, Lequesne G W, Gent R J-Ultrasonic features of acute osteomyelitis in children. J Bone Joint Surg Br 1994;76(6): 969-74. Chandnani VP, Beltran J, Morris CS et al-Acute experimental osteomyelitis and abscesses-detection with MR imaging versus CT; Radiology. 1990 Jan;174(1):233-6. Cierny G, Mader JT, Penninck JJ. A clinical staging system for adult osteomyelitis; Clin Orthop Relat Res. 2003 Sep;(414):7-24. Roine I, Arguedas A, Faingezicht I, Rodriguez F. Early detection of sequela-prone osteomyelitis in children with use of simple clinical and laboratory criteria. Clin Infect Dis. 1997 May;24(5):849-53. Tetzlaff TR, McCracken GH Jr, Nelson JD. Oral antibiotic therapy for skeletal infections of children. Therapy of osteomyelitis and suppurative arthritis. J Pediatr 1978;92:485-90. Peltola H, Pääkkönen M, Kallio P, Kallio MJT. Clindamycin vs. first-generation cephalosporins for acute osteoarticular infections of childhood — a prospective quasi-randomized controlled trial. Clin Microbiol Infect 2012;18:582-9. Dubnov-Raz G, Scheuerman O, Chodick G, Finkelstein Y, Samra Z, Garty BZ. Invasive Kingella kingae infections in children: clinical and laboratory characteristics. Pediatrics 2008;122:1305-9. Atkins BL, Price EH, Tillyer L, Novelli V, Evans J. Salmonella osteomyelitis in sickle cell disease children in the east end of London. J Infect 1997;34: 133-8. Liu C, Bayer A, Cosgrove SE, et al. Clinical practice guidelines by the Infectious Diseases Society of America for the treatment of methicillin-resistant Staphylococcus aureus infections in adults and children. Clin Infect Dis 2011; 53:319. Jagodzinski NA, Kanwar R, Graham K, Bache CE. Prospective evaluation of a shortened regimen of treatment for acute osteomyelitis and septic arthritis in children. J Pediatr Orthop 2009; 29:518-25. Gomez M, Maraqa N, Alvarez A, Rathore M. Complications of outpatient parenteral antibiotic therapy in childhood. Pediatr Infect Dis J. 2001 May;20(5):541-3. Bachur R, Pagon Z. Success of short course parenteral antibiotic therapy for acute osteomyelitis of childhood. Clin Paediatr (Phila) 2007;46(1)30-5. Martí-Carvajal AJ, Agreda-Pérez LH. Antibiotics for treating osteomyelitis in people with sickle cell disease. Cochrane Database Syst Rev 2012;12:CD007175. Meller I, Manor Y, Bar-Ziv J, Torok G. Acute hematogenous osteomyelitis in children: long-term results of surgical treatment. Orthop Rev 1989; 18:824-31. Street M, Puna R, Huang M, Crawford H. Pediatric Acute Hematogenous Osteomyelitis. J Pediatr Orthop. 2015 Sep;35(6):634-9. Hollmig ST, Copley LA, Browne RH, Grande LM, Wilson PL. Deep venous thrombosis associated with osteomyelitis in children; J Bone Joint Surg Am. 2007 Jul;89(7):1517-23.